Our/Los Angeles, a distillery in Los Angeles, California, has created a unique concept to build, promote and elevate their brand using taste – the vodka, listen – a podcast they have launched about their beloved L.A., and read – a zine that is illustrated by local artists and that accompanies each episode of the podcast. Taste. Listen. Read. A first for the spirits industry and something that Managing Partner, Anton Van Der Woude, feels sets them apart from other liquor brands out there. Anton has spent the last 10 years in the alcohol industry, working on different brands in various countries. Today he is thankful to be working on his own brand: Our/Los Angeles. I spoke with Anton recently and we talked about the global/local aspect of building the brand. Our/Los Angeles has several micro distilleries in the Our/Vodka family, from New York to London to Berlin, and this global/local identity serves to further their ties within the communities of each city’s distillery, giving the brand that warm, fuzzy feeling of closeness with local ingredients used in each location, while remaining international and a player within the spirits industry. Anton said that using voice and the zine to connect with the people, either locals or visitors to L.A., to help them understand the creativeness and beauty that lives within the City of Angels, is just another leg of the stool that connects the brand to L.A. and its various cultures. And while Our/Los Angeles is the only one of the micro distilleries using the concept of taste, listen and read for now, Anton said who knows what the future may bring for all if the unique idea becomes a huge success. Mr. Magazine™ will keep an eye out on this emerging brand – and be “taste buds” ready for the possible expansion. Who knows – Our/Oxford may be on the horizon. So, I hope that you enjoy this fascinating Mr. Magazine™ interview as we take a trip to Our/Los Angeles and immerse ourselves in the Our/Vodka culture with Anton Van Der Woude. 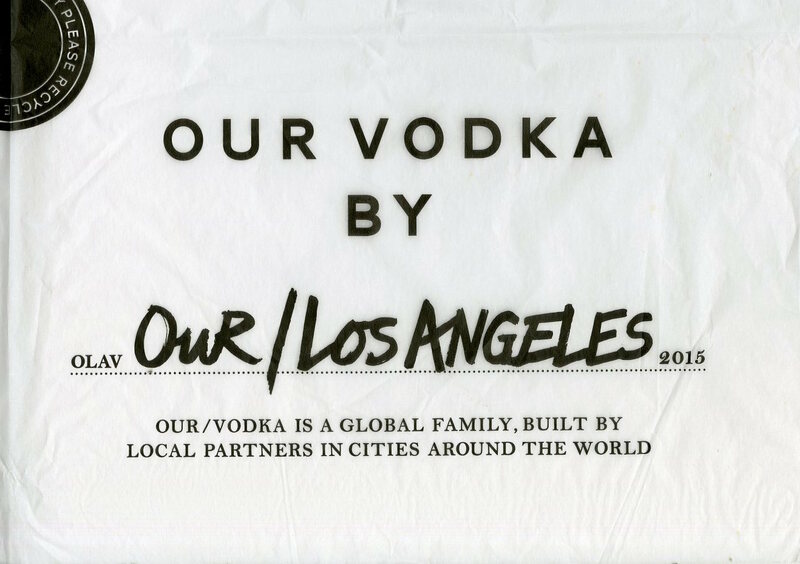 On what he is trying to do with his Our/Vodka, Our/Los Angeles brand and its podcasts and zine: Our/Los Angeles is the name of our brand and it’s really a celebration of the city and the people in it. Given the fact that the name of our brand is Our/Los Angeles, we’re doing a lot of things to further our ties with the city. And really, we want to be synonymous with everything that’s iconic to L.A. And there are so many weird and wonderful, crazy things going on in this city and everyone is so different here, but the one thing that everyone shares is a love of this wonderfully crazy city. On whether they plan to expand the concept into more cities: Right now it’s just the focus on L.A. We do have a distillery in New York and we have a distillery in London, and although we’re part of the same family, each distillery is run independently. They’re the same brand; the same P&L with the same positioning. But right now Los Angeles, we’re the only one that has developed this concept of the podcast and the zine. If we have tremendous success with it, the other cities may pick it up and follow a similar concept, but for now it’s just us. On whether he feels he is a content marketer, content provider or just someone who loves L.A. and its many cultures: This is more of a celebration of the city. Myself personally, I have a sales background and a commercial background. And that’s the part of the business that I run. My business partner is the marketer, he’s had a long distinguished career in the world’s top agencies. He ran Vista Innovations for Leo Burnett and opened several of their American offices. And this was his idea. One of the reasons that we decided to go this route as well is no alcohol brand has ever used voice as a medium to build their brand. So, given that we’re called Our/Los Angeles, we can turn this into not being just about vodka. And we feel that there is a really good opportunity to use voice to build the brand. On why he felt in this digital age he needed a zine to go along with the voice: Because we felt that it completed the package. It’s another way of collaborating and tying in links with local artists. The local zine artist is pretty well-respected. Also with the three, we have the taste – the vodka; we have the listen – the podcast; and we have the read – the zine. So, it’s full circle really. Taste, listen and read. And we felt that was the complete local package for hotels. On what he would hope to tell someone the brand had accomplished a year from now: I would like to say that it would be a staple for all major hotel groups in the Los Angeles area. I would like to feel that’s what we are known for. This package is pretty different; there’s nothing else out there like it, no alcohol brand has used voice as a medium to build their brand. And so we think it’s pretty exciting and innovative. And for us, there’s no reason why it shouldn’t be in every single major hotel in Los Angeles. On what reaction he is aiming for with his audience: It’s to help them understand this city and what’s going on here. And all of the wonderful things they can enjoy when they’re visiting it. Also, the rich, creative culture of Los Angeles; it’s pretty incomparable to anywhere else in the world. One in every six jobs is creative in this city and people come from all over the world, specifically, for that very reason. There’s just a lot going on and we really want to expose that, and to associate our brand with everything that’s going on in the city. And we want to educate and to share. On anything he’d like to add: The concept of the brand itself is very unique. Again, this is the first time it’s ever been done before in the history of the spirits industry. It’s been done in other industries, but not in liquor. We are the first brand ever to have both a global and local identity at the same time. What I mean by that is earlier I referred to us as having sister distilleries in London and New York and we have one in Berlin; we’re all micro distilleries and we all run independently, as I said. However, we all distill to the same uniform global recipe, but we use local ingredients at every distillery. So, Our/New York tastes different from Our/Los Angeles. The branding looks the same, the bottle looks the same, it’s just says Our/New York or Our/Berlin instead of Our/Los Angeles on the label. On what he would have tattooed upon his brain that would be there forever and no one could ever forget about him: For me, I would like it to be the success of Our/Los Angeles. I’ve worked on a lot of brands all over the world and I’ve been in the alcohol industry now for over ten years and I finally have one of my own. I’ve always worked for other brands, and one of the reasons this opportunity is so exciting for me is because I get a chance to build my own from scratch. It takes years to build a brand; it’s a very saturated market. There’s not a lot to differentiate each of the brands out there. I would hope that, in years to come, my name will be associated with the success of the brand along with the rest of the team. On what someone would find him doing if they showed up unexpectedly one evening at his home: Given the nature of the business, for the first part of the evening, almost every evening, I’m out, picking up relationships, visiting cocktail bars, etc., so that when I get home, I live in a little bit of a zoo. I have 10 animals and animals are very important to me, and so when I get home I tend to the zoo. On what keeps him up at night: When you’re starting out, and this goes back to the fact that it takes a long time, it takes years to build a brand, and you can be working 24 hours a day and things can be going brilliantly well, but it takes a little bit of time for those successes to be reflected in the P&L of the business. And of course there are moments that can be disheartening, that you’re working so hard and you essentially feel that you’re making so much progress when it comes to the P&L and making money; but it takes a while for those day-to-day wins to be reflected. So really, I guess if I’m ever up at night it’s due to lack of management on my part on that front. I just occasionally get a little impatient and worried that there will be difficulties with all of this. And now the lightly edited transcript of the Mr. Magazine™ interview with Anton van der Woude, managing partner, Our/Los Angeles Vodka. Samir Husni: Give me that combination of Our/Vodka brand, with the podcast, and with the zine; what are you trying to do with these entities? Anton van der Woude: Our/Los Angeles is the name of our brand and it’s really a celebration of the city and the people in it. Given the fact that the name of our brand is Our/Los Angeles, we’re doing a lot of things to further our ties with the city. And really, we want to be synonymous with everything that’s iconic to L.A. And there are so many weird and wonderful, crazy things going on in this city and everyone is so different here, but the one thing that everyone shares is a love of this wonderfully crazy city. And we’ve designed a local package essentially; it was originally designed as an idea for a hotel and an in-room package for hotels. And the idea was our little .375 bottle really lends itself to portability, gift-ability and share-ability. It has won design awards and it’s great in the rooms. We really wanted to further the local package, so we came up with the idea of podcasts. 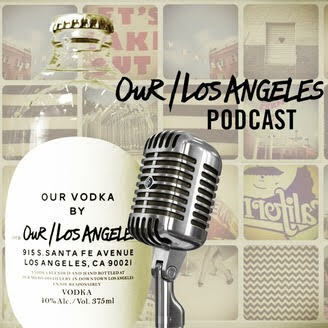 And the podcast is not about vodka, it’s about Our/Los Angeles. And we’ve had a wonderful range of speakers, everything from local politicians to music venue owners; we even had the Drag Queen of L.A.; we had a white witch, we’ve just had everything under the sun, in terms of guest speakers. And we also created a little physical zine to accompany the podcasts and the idea is that in the room you can taste, read and listen to something local. It appeals to locals and tourists alike. If you want to tune in to a little bit of culture, little bit of history, you can do that. Or if you’re simply looking for the latest cool hotel roof to go and have a drink at on your trip, there’s information on that. And the zine accompanies the podcast; we have a zine for each episode. It’s done by a local artist who is well known in that world. As I said earlier, we really want to be synonymous with everything that’s iconic to L.A. and there are so many creative things going on here that we felt this was a good way of furthering our ties with the city without just being about a vodka brand. 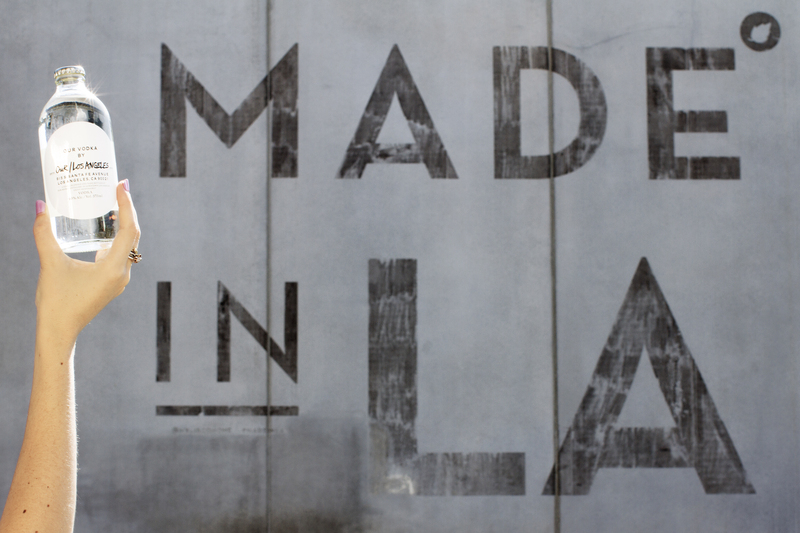 This isn’t just about vodka; it’s about the love for Los Angeles. Samir Husni: So, is it about the love of Los Angeles today; maybe tomorrow it’s the love of New York and San Francisco; do you plan on expanding this into more locations than L.A.? Or are you L.A. bound and kept? 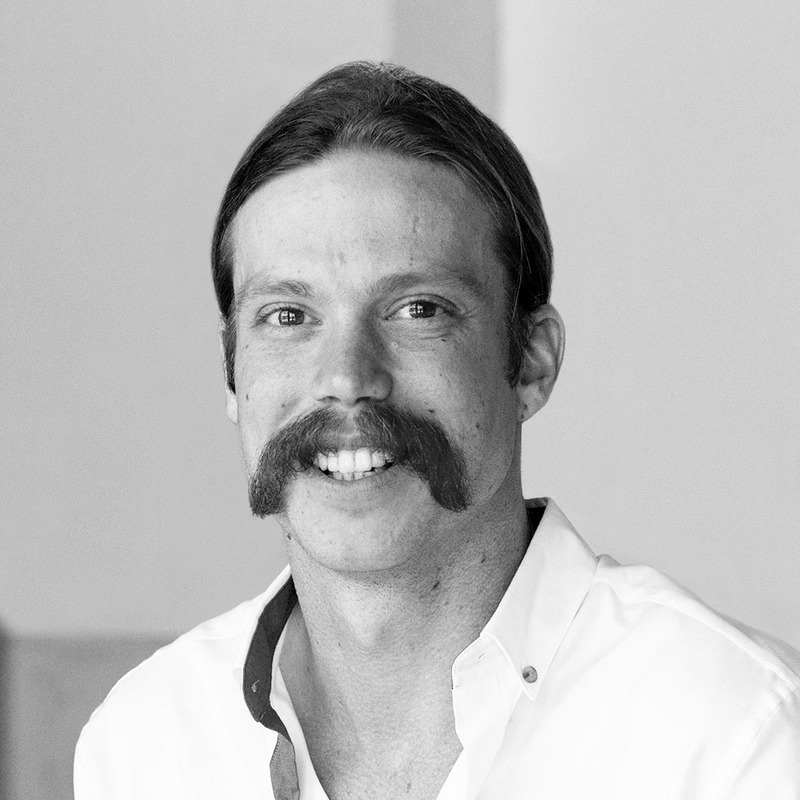 Anton van der Woude: Right now it’s just the focus on L.A. We do have a distillery in New York and we have a distillery in London, and although we’re part of the same family, each distillery is run independently. They’re the same brand; the same P&L with the same positioning. But right now with Los Angeles, we’re the only one that has developed this concept of the podcast and the zine. If we have tremendous success with it, the other cities may pick it up and follow a similar concept, but for now it’s just us. Samir Husni: Do you consider yourself a content marketer or a content provider now, or is it simply because you’re in love with L.A. and its culture that you’re doing this? Anton van der Woude: This is more of a celebration of the city. Myself personally, I have a sales background and a commercial background. And that’s the part of the business that I run. My business partner is the marketer, he’s had a long distinguished career in the world’s top agencies. He ran Vista Innovations for Leo Burnett and opened several of their American offices. And this was his idea. One of the reasons that we decided to go this route as well is no alcohol brand has ever used voice as a medium to build their brand. So, given that we’re called Our/Los Angeles, we can turn this into not being just about vodka. And we feel that there is a really good opportunity to use voice to build the brand. Samir Husni: In this digital age that we live in, why did you feel that in addition to voice you needed to have a zine to go along with the voice? Anton van der Woude: Because we felt that it completed the package. It’s another way of collaborating and tying in links with local artists. The local zine artist is pretty well-respected. Also with the three, we have the taste – the vodka; we have the listen – the podcast; and we have the read – the zine. So, it’s full circle really. Taste, listen and read. And we felt that was the complete local package for hotels. Samir Husni: If you and I are having this conversation a year from now, what would you hope to tell me that you’ve accomplished in 2019? Anton van der Woude: I would like to say that it would be a staple for all major hotel groups in the Los Angeles area. I would like to feel that’s what we are known for. This package is pretty different; there’s nothing else out there like it, no alcohol brand has used voice as a medium to build their brand. And so we think it’s pretty exciting and innovative. And for us, there’s no reason why it shouldn’t be in every single major hotel in Los Angeles. Samir Husni: How will the vodka be allocated, in the minibars? Anton van der Woude: Yes, it will be in the minibars in the rooms. The bottles of vodka are small .375 bottles. Samir Husni: You have the concept of taste, listen and read and it has been tried before with craft beer. I have a magazine from Australia that was published with the help of the craft beer industry, where with every beer you read an article. After people have experienced those three elements, taste, listen and read, what do you expect their reaction to be? What are you aiming for? Anton van der Woude: It’s to help them understand this city and what’s going on here. And all of the wonderful things they can enjoy when they’re visiting it. Also, the rich, creative culture of Los Angeles; it’s pretty incomparable to anywhere else in the world. One in every six jobs is creative in this city and people come from all over the world, specifically, for that very reason. There’s just a lot going on and we really want to expose that, and to associate our brand with everything that’s going on in the city. And we want to educate and to share. Anton van der Woude: The concept of the brand itself is very unique. Again, this is the first time it’s ever been done before in the history of the spirits industry. It’s been done in other industries, but not in liquor. We are the first brand ever to have both a global and local identity at the same time. What I mean by that is earlier I referred to us as having sister distilleries in London and New York and we have one in Berlin; we’re all micro distilleries and we all run independently, as I said. However, we all distill to the same uniform global recipe, but we use local ingredients at every distillery. So, Our/New York tastes different from Our/Los Angeles. The branding looks the same, the bottle looks the same, it’s just says Our/New York or Our/Berlin instead of Our/Los Angeles on the label. What this means is that people can resonate with the brand around the world, but drink locally in each city. And that’s genius. It’s the way the market is going, with globalization, today the world is so small, everyone has roots everywhere. People want to be able to drink under and recognize a trusted name, but yet drink locally in each place with individual characteristics. And until now, you’re a cross distillery or you’re a big national and there’s no one who has this global/local identity, and for me, it’s the way the market is going. And one of the reasons that I’m a part of this project. Anton van der Woude: Maybe that I’m British and I don’t know L.A. as well as I claim to. (Laughs) Apart from that, the biggest misconception about me…I’m not sure. I guess that would be my answer. Anton van der Woude: For me, I would like it to be the success of Our/Los Angeles. I’ve worked on a lot of brands all over the world and I’ve been in the alcohol industry now for over ten years and I finally have one of my own. I’ve always worked for other brands, and one of the reasons this opportunity is so exciting for me is because I get a chance to build my own from scratch. It takes years to build a brand; it’s a very saturated market. There’s not a lot to differentiate each of the brands out there. And again, this is one of the reasons that we’re trying to do things really differently, like launch the podcast. I have a marketing campaign that’s – you know, alcohol is always traditionally done inside and because of our little .375 and its’ portability, we’ve got a whole marketing campaign about the short trip space. We’re really trying to do things a little differently and innovate, and the only way to survive in this market is to be constantly innovating and be one step ahead. I would hope that, in years to come, my name will be associated with the success of the brand along with the rest of the team. Samir Husni: If I showed up unexpectedly at your home one evening after work, what would I find you doing? Are you drinking Our/LA; reading a magazine; cooking; watching TV; or something else? How do you unwind? Anton van der Woude: Given the nature of the business, for the first part of the evening, almost every evening, I’m out, picking up relationships, visiting cocktail bars, etc., so that when I get home, I live in a little bit of a zoo. I have 10 animals and animals are very important to me, and so when I get home I tend to the zoo. Anton van der Woude: When you’re starting out, and this goes back to the fact that it takes a long time, it takes years to build a brand, and you can be working 24 hours a day and things can be going brilliantly well, but it takes a little bit of time for those successes to be reflected in the P&L of the business. And of course there are moments that can be disheartening, that you’re working so hard and you essentially feel that you’re making so much progress when it comes to the P&L and making money; but it takes a while for those day-to-day wins to be reflected. So really, I guess if I’m ever up at night it’s due to lack of management on my part on that front. I just occasionally get a little impatient and worried that there will be difficulties with all of this.